An oddity from the great Yaoganxian mine, sharp rosettes of Pyrhotite (rare at this locale) that are coated by secondary Sulphides and associated with Chalcopyrite and Pyrite. 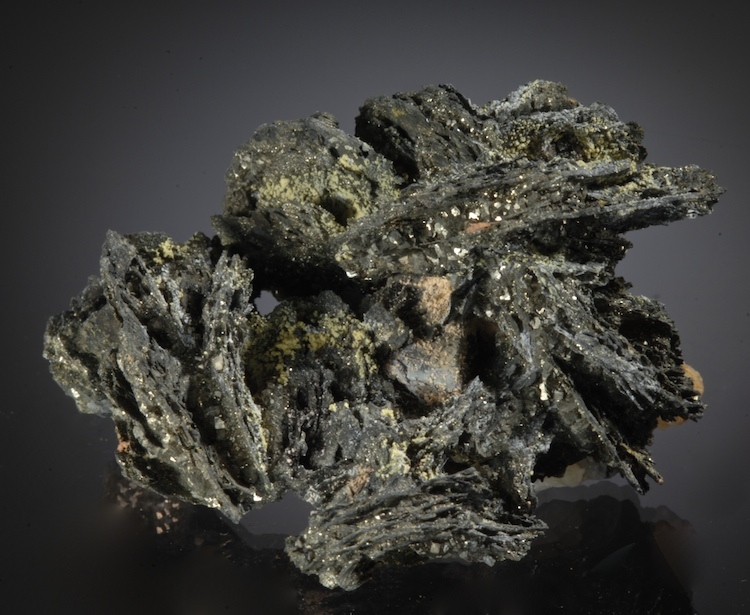 The Pyrrhotite has been partly or entirely replaced by what is likely pyrite but could also be Chalcopyrite. Both species are on the speciems matrix. Delicate and well formed this was part of a small find we obtained at the mine in 2003. I have not seen these since then. Uncommon and a nice example for any good Yaogangxian suite. 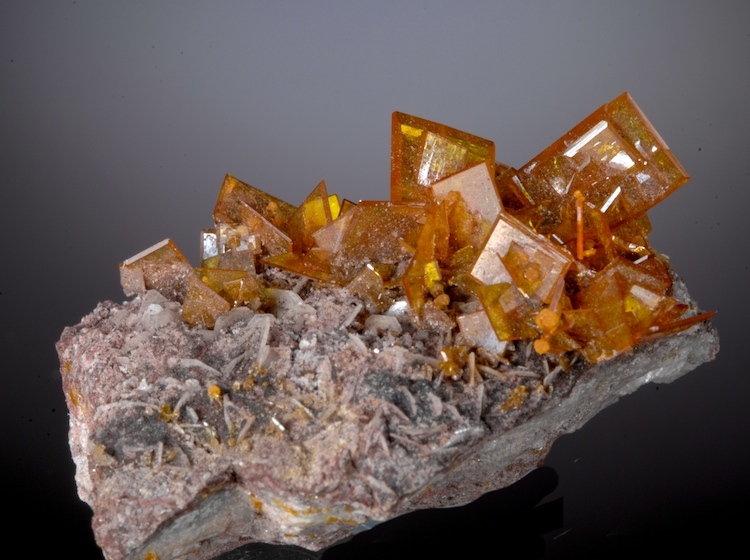 An excellent, fine, delicate and colorful specimen of windowpane Wulfenite on matrix. A few tiny bits of Mimetite are found on close inspection. In incredible condition for such a delicate mineral, with good magnification I can find only one tiny chipped crystal that is out of sight anyway, essentially perfect. This was found in the last mining attempts at Rowley, that project is now finished and there may never be any more of these. A clean, classic and very esthetic specimen. 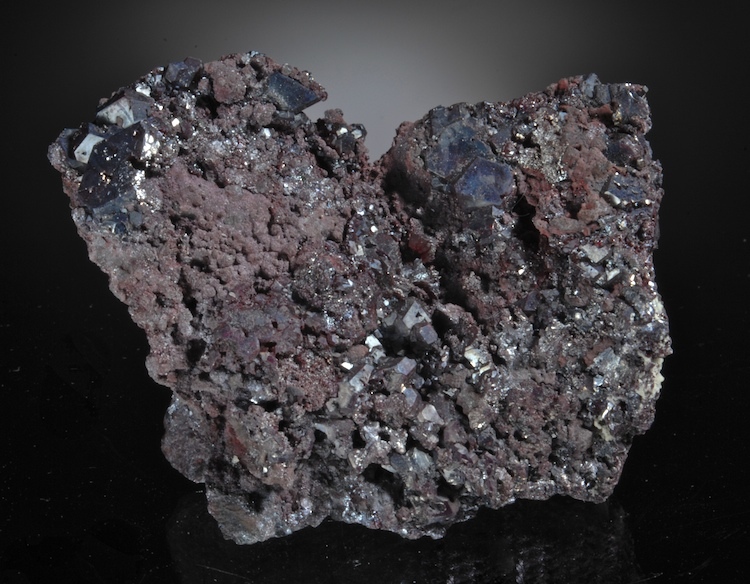 Cuprite- large well crystallized mass. 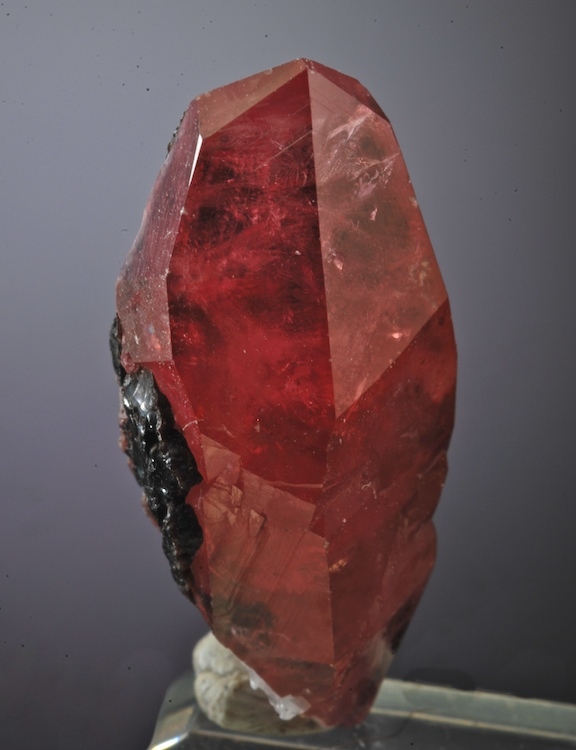 A sizable pure mass of Cuprite, nearly all crystallized with individual crystals reaching 1.5 CM. A few small vugs have some hairy Cuprite V. Chalcotrichite, in excellent condition overall, this is a rich specimen from a classic locality. Better in person. 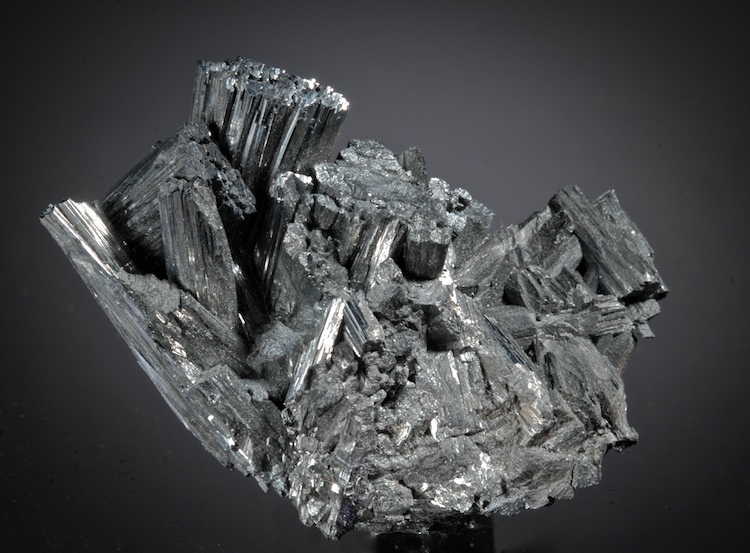 A fine, old German Manganite with very lustrous metallic crystals. Looks good on all sides but the "front" is a bit better. Typical crystal habits reaching to 3.3 CM. Some contacts and breakage keeps the price very low for one of these classics yet this still displays quite well. 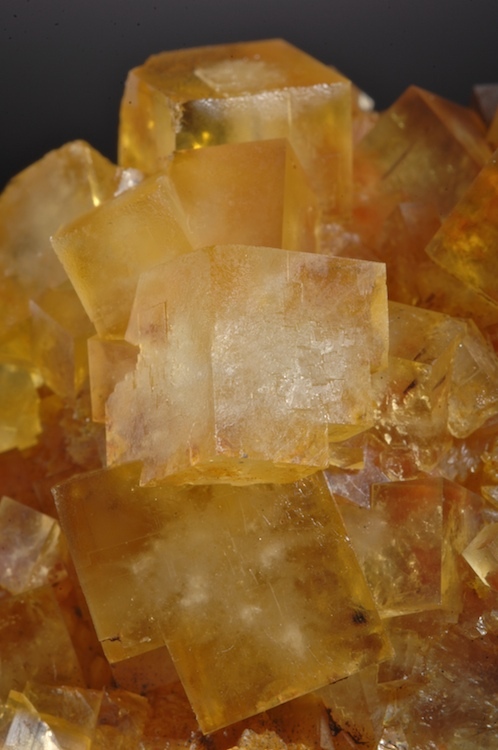 Glassy bright yellow Fluorite with sharp transparent cubes in an esthetic cluster. From a new find in the Hamada area that has produced much better than previous specimens. Choice display specimen with distinctive habit and color. All of the main crystals are perfect, undamaged which is rare in a Moroccan Fluorite. A choice single scalenohedral Rhodo crystal with a small bit of matrix adhering to the back and bottom. Super bright color and sharp, glassy prism faces. The lower termination has some contacts on the back side but otherwise this is in super fine condition and the front side displays very clean as seen. An excellent Peruvian thumbnail that looks a bit like a South African. Choice. A really attractive and different sort of Fluorite. The Emerald mining area at Penas Blancas has produced a very small number of highly etched Fluorites over the past 2 decades. Most are cubes a a few are Octahedra, most are colorless and a few are pink. 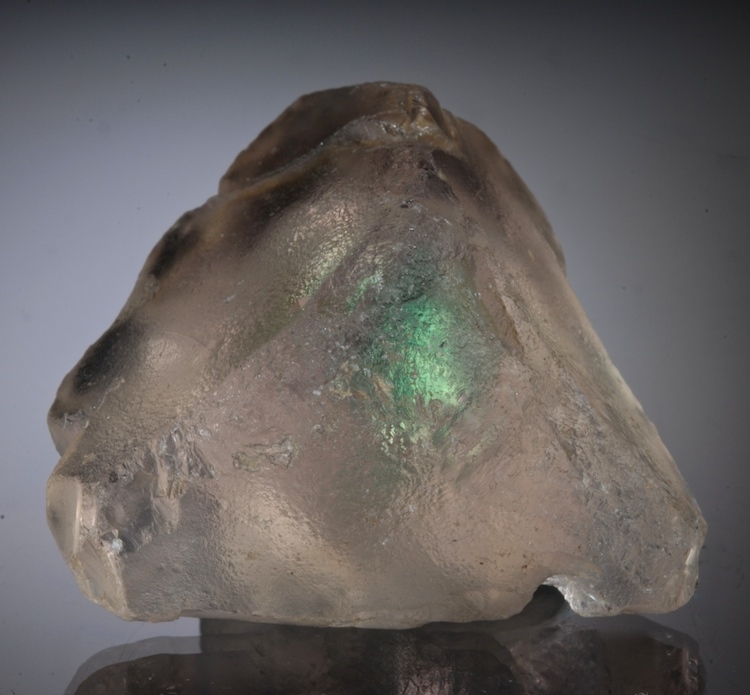 These are usually very deeply etched and re-crystallized and sometime have emerald green globs in the center or corner of the crystal. This is a pink corner of an octrahedron that is naturally etched and has a nice green spot in the center. Gemmy enough to be faceted, this unusual habit is I belive only in a small prospect about 250 meters higher above than the Penas Blancas Emerald zone. A very good example of a rare form. 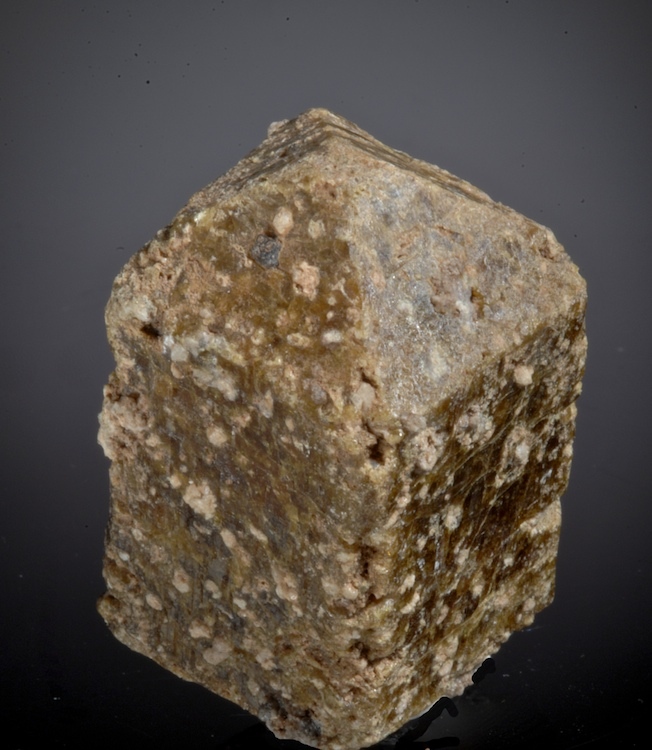 Vesuvianite- Doubly terminated ex Neal Yedlin etc. A complete "floater" of doubly terminated Vesuvianite that is textbook perfect, from what was long called Lago de Jaco in Coahila, Mex. but is now considered to be Sierra de la Cruz. This has a fine and long pedigree, it has labels from Neal Yedlin, Ron Bentley, Bud Webster etc. No damage, a few crude Grossular are sprinkled on the prism faces. Likely vintage 1960s, no more have been found for decades.